"When you think about it, my primary function in life is to prevent manuscripts from reaching the desks of people who can potentially buy them! That, and eating tuna." "If it isn't original, I am not interested. "If it is original, it is different. "If it is different, I cannot sell it. "If I cannot sell it, I am not interested." Who is Bad Agent Syndey? How could you not have heard of me? Read this. Is Sydney taking on new clients? I don't have an agent yet. What advice can you give me, Sydney? You are a LOSER. Hang a big LOSER sign around your neck LOSER. Can't I sell a book without an agent? No. It didn't happen, and nobody saw it when it happened, so No. Loser. Do you just like being mean? Do you have an office close to New York? I work out of my home with my People on the Oregon coast. This is next to an ocean, and New York is also close to an ocean, so the answer would be, "Yes." What are your qualifications to be an agent? That is a loser question, you losery loser you. Greenies! But the other will do in a pinch. Is there anything I can do to persuade you to become my agent? Clean my cat-box! It won't help you, but my cat-box is dirty! Sydney is so important she needed a second FAQ. See "Part the 2." Sydney Says: These are things you need not trouble your little head with. 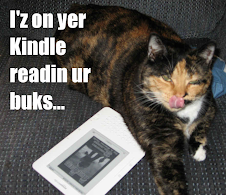 Welcome to the official blog of the Sydney T. Cat Literary Agency! Sydney is known far and wide as the world's worst literary agent! Of course, she isn't bad -- for a cat! Yes, as not everyone knows, there are no laws (in the United States, anyway) regulating literary agents. Pretty much anybody who can print some business cards, stationary, or maybe just put up a blog or web site, can call themselves a literary agent! So one day, Sydney thought, "why not me? Don't I DESERVE at least 15% of everything? (Actually, what she thought was, "GIVE ME TUNA," but it's all there if you read between the lines. So, over on our home-blog, YorkWriters.com, I posted an announcement. I kind of figured that, like so many of Sydney's ideas, it would simply go away the first time she was distracted by a small, moving, object. But no, people started asking where they could send submissions and if she was taking on clients. The answer on #1: "Sydney is a busy cat. Save her the time, and shred them yourselves." The answer on #2: "No, but feel free to send bribes using my PayPal donation button. PURRRRRRRRRR!" You can, however, pretend to be a Sydney client by purchasing a souvenir or clothing item from her Cafe Press shop in the sidebar to your right. Sydney will also, periodically, answer your writing and publishing questions in the worst way possible. Free free to post them in comments here, or email care of me, her slave person. Steve here: A while back I happened to mention that my Cat, Sydney, was as well-suited to be a literary agent as many of the self-selected people out there claiming the title. I expected this would make people laugh at the absurdity of the idea. Shows you how stupid I am. What I got was a bunch of emails from people asking if Sydney was taking clients, where people should send their queries and manuscripts. It seems that people are so eager to sign with an agent, any agent, that even a highly obese and self-centered calico short-hair with an IQ that's pretty low, even for a cat, can be successful in the agent business. So successful, in fact, that she's hired me. You see, readers are your audience. The real reason you should be writing books. But the reality of the business is that publishers have long been the gatekeepers between writers and readers. Problem is, that whole gatekeeper thing was really cutting into their time, so years ago they outsourced most of that to agents. Meaning that the gatekeepers then had gatekeepers. That worked for a while, but anyone whose been on a writer's web-board or writer's conference lately knows the feeding frenzy associated with signing anybody who calls themselves an agent. It's really hard to be so popular, and its really wearing on agents. Sometimes just processing all the highly-paid speaking engagements, conference appearances, tours hawking their own books, consulting and editing gigs, gifts, flowers, and offers of sexual favors is just exhausting! It's a wonder any of them find any time at all to try market books, make deals, or take care of their clients. In fact, some of them don't. For a lot of them, it's not really the profitable part of their business anyway (which doesn't seem to deter people from wanting to sign with them). Those agents who take their jobs seriously and focus on their clients and the selling of books have clearly missed the boat. Anyway, that's why Sydney has hired me. Clearly she doesn't have time to deal with the lot of you, and needed an assistant to handle the mail and deposit the checks in her account. So here I am, the gatekeeper to the gatekeeper to the gatekeepers. Kind of a sweet position, when you think of it. I'm wondering if I should milk it? Why restrict myself just to Sydney, when there are so many even-less-qualified "agents" out there I could be fronting for? Of course, I'll need a new job title for it. Can't be an "agent agent," can I? Hmmm. How about "Bgent," which is naturally what comes after "Agent." Anyway, as promised, I've been opening Sydney's mail so she can answer some of your (to you, anyway) very important questions about agents and/or publishing. I turn it over to the very busy ("it would be an honor for you just to touch her cat-sand") Sydney T. Cat, Bad Agent. Pion! Where the hell are my Greenies! So sorry, darlings. It's so hard to get good help these days. 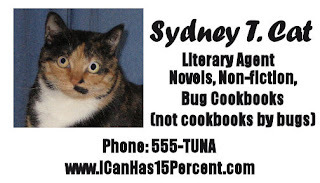 Response to our post "Announcing the Really Bad Literary Agency," has been overwhelming -- mostly from writers wanting to sign with agent Sydney T. Cat. Still, she has an intense desire to exploit -- uh -- help every struggling writer out here. To that end, Sydney is accepting questions about the writing business to which she will respond publicly with her famously bad advice. So if you have a question about how publishing works, submissions, manuscript format, editors, agents, royalties, contracts, or anything else, just drop it in a comment at the end of this message, or email it care of me ( j-steven-york @ sff.net ) and she will try to get to it in a future post. Until then, Sydney suggests the best thing that you can do for your writing career is to keep yourself warm in a Sydney tee-shirt from her shop, pick up your favorite catnip toy in your mouth, and tunnel under a blanket to wait for help. Hopefully, Syd will talk to you soon. Though Sydney is not taking clients, NO WRITER SHOULD BE DENIED PROPER SUPERVISION BY A CAT! Fortunately, there are many homeless kitties in shelters across the country just waiting for writers to supervise! Find out more HERE! 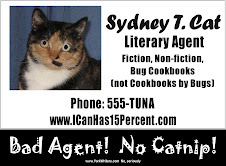 Introducing Bad Agent Sydney T. Cat! The other day Chris and I were having lunch with some writer friends when somebody made the joking comment (I forget the exact context), "just so you don't hang up a shingle and become an agent!" Which got me to thinking. Why the heck not? I mean, I'm qualified, or at least as qualified as many of the so-called agents out there. More so actually. Now, am I qualified to be the sort of agent I'd want to have? Probably not. But I'm plenty qualified to be the sort of bad agent that most people desperate for an agent are going to end up with. Okay, drawing a blank here. That's because there pretty much are no qualifications. One editor I know has reportedly said, "You know what you needed to be an agent? Stationery." I'd qualify that, because we live in the age of computers, laser printers, email, Facebook, and Twitter. You don't even need stationery any more. In fact, if she could type her name into the computer, my cat could be an agent. Yes, that's right. Anybody can call themselves a literary agent. There's no license required. No certification. No required training. No required degree. No test. Simply the willingness to call yourself an agent. Of course, good agents are better qualified. They have extensive knowledge of business, contracts, and the publishing industry. They're skilled negotiators and have a gift of salesmanship. But that's not what we're going for here at the Really Bad Literary Agency, so it's really lucky for us that most agent-hungry writers out there would never think to ask about their agent's qualifications and experience. The agent might be insulted and fail to sign them up, and as we all know, having any agent is way more important than having a good one.